Today we are looking at Valerian Toys. These valerian toys are produced by 4cats (click for more details) a German company. We will also be giving away one of these toys at the bottom of this post. Just like with the catnip toys we previously reviewed here it is to note that not all cats will go mad for valerian. It is said that on average between 50 and 70 percent of cats are attracted to this, which is why you may find that your own house tiger doesn’t go mad for it. Time to look at the toys we got for the kitties. With christmas just on the horizon we thought it be nice to get some themed toys! And aren’t they cute and christmasy :D? Available as gingerbread man, stocking and christmas parcel! While Oliver was semi attracted by the valerian toys he wasn’t 100% sure about them. He is more of a catnip cat which brings us back to not treating these plants as identical! Have you watched the video carefully? Despite Oliver not liking valerian something happened towards the end of the video! Nubia will carefully choose your toy though needless to say it won’t be the gingerbread man unless you want it covered in cat slobber <3. To enter our giveaway please click here. 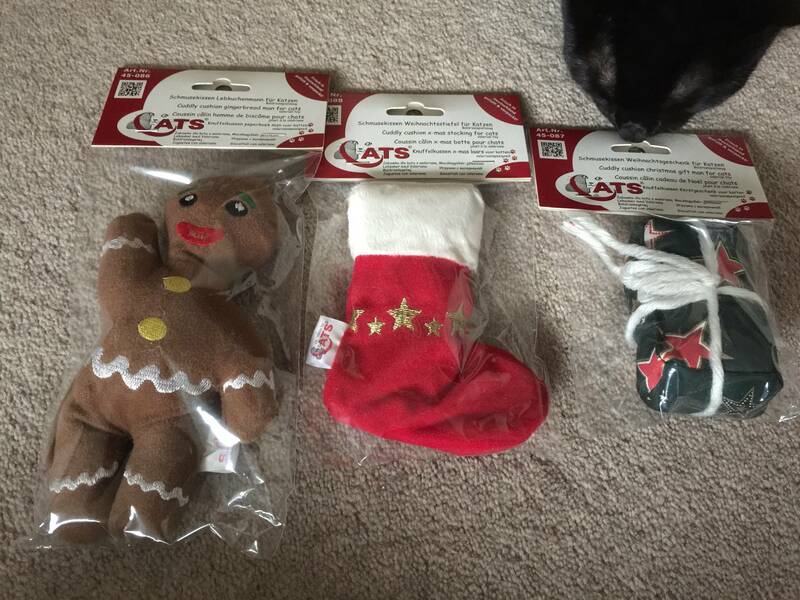 If you would like to find some for your kitties they are available in the UK from Specially 4 cats as well as in the purrfect box subscription service which we have talked about here. This entry was posted in Giveaways, Nubia, Toys and tagged 4cats, cat, cats, cute, katze, katzen, kawaii, Nubia the cat, ねこ, ﾈｺ, 猫.
I’ll have to check in my pet-store just across the streets then – no need do ship it to Germany again. Would love to win one for our Sonu Singh! He’s a crazy cat n needs more toys!!!! I would like to enter. Have followed on twitter liked your facebook and shared. We have a couple of valerian toys but they don’t seem to attract us as much as nip toys do. But we’d love to give these toys a try! Such cute toys. I never knew cats like Valerian root, good to know. Nubia is such a beauty! !